As many as two million amputees in the United States suffer from chronic pain. Chronic pain may either be isolated to the residual limb in the form of a neuroma or present as phantom limb pain in a limb that is no longer present. Phantom limb pain is a complex, pain syndrome that is described as burning, aching, or electric-type pain in the amputated limb. Inadequate control of preoperative and postoperative pain may increase the risk of chronic amputation pain. Treatment of phantom limb pain is approached in a manner similar to treatment of other conditions leading to chronic neuropathic pain. Stump pain: Pain localized to the amputated stump. Patients may also suffer from the presence of a neuroma at a specific point on the stump. A neuroma is a disorganized growth of nerve cells at the site of a nerve injury. A neuroma occurs after a nerve is partially or completely disrupted by an injury — either due to a cut, a crush, or an excessive stretch. During limb amputation, the nerves are cut and one end is removed with the limb, preventing the nerve from repairing itself. Neuromas can be painful and can cause tingling sensations when tapped or when pressure is applied. Although not always the case, a neuroma can be extremely painful and can cause significant loss of function for the patient by limiting motion and contact with the affected area. This can also make wearing a prosthesis impossible. The chronic pain associated with these processes can have a significant effect on a patient’s quality of life and functionality. Prior treatments for neuromas and phantom limb pain have involved both surgery and medications, such as neuromodulators like gabapentin. Standard surgical intervention usually involves excision and burying of the nerve containing the neuroma. However, the nerve that is buried can possibly form another neuroma. Phantom limb pain is even harder to prevent or treat. At the Institute of Advanced Reconstruction, we perform the latest groundbreaking techniques to treat both neuromas and phantom limb pain. We perform a procedure called Targeted Muscle Reinnervation (TMR). 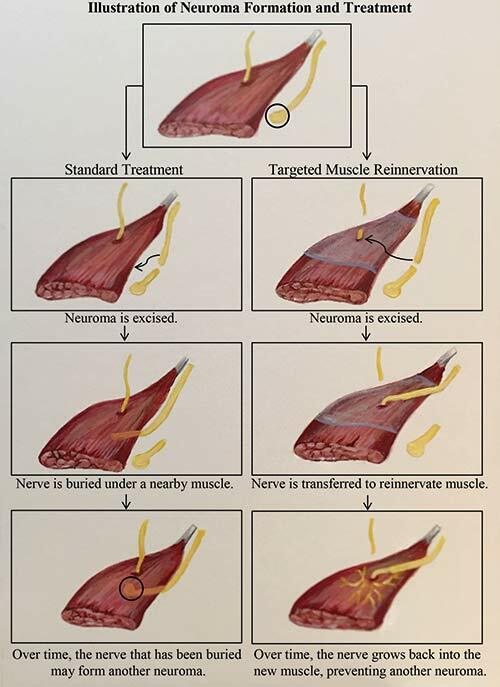 TMR surgery involves the transfer of nerves that once controlled the amputated limb to reinnervate (restore function to) remaining muscles. Following surgery, nerves grow back into the new muscles, decreasing and potentially preventing misdirected nerve growth, which can contribute to pain within the residual limb. TMR has the potential to treat pain from neuromas while enabling amputee patients to return to their activities of daily living and improve prosthetic use and tolerance.